They are the reason behind the success of the Spring Meeting 2019, and who can better tell their story but the team itself. In this edition of the 30 seconds with segment meet our amazing organizers from oikos Belgrade! When it comes to challenges, our team always faces them with courage and always tries to go beyond our capabilities. But by accepting the challenge of organizing such a big and important conference, we surpassed all our ambitions. This small, but unique team of six invested a lot of efforts and worked hard to deliver the Spring Meeting 2019. The result is an unforgettable experience, new knowledge, skills, and life-long friendships, as well as the inevitable fun – because Belgrade cannot be without it! And who are the oikees who took almost perfect care of everything? (’’almost – because it can always be better’’- it’s forever our motto)? Zvezdana, president of oikos Belgrade is for sure a person who deserves the most credit for hosting the Spring Meeting in Belgrade. By accepting responsibilities and obligations, she managed to coordinate all the members and tasks, every day she worked to improve this project and justify the trust of her team, participants and oikos International. As we heard, she defied all expectations. That’s why, deservedly, she was the most cheerful at the party! Aleksandra, known as our financial director, dealt with finances, accounts, mathematics and numbers, before, during and after the conference. So it’s not surprising that almost all the time, she looked like she was solving the toughest of equations. Soon-to-be-economist, she mastered her profession even before graduation thanks to oikos and the Spring Meeting. Indeed, she never miscalculated! Stefan, without whom the entire project would be impossible. He communicated with the International team, took care of guests and participants, selected applications, fulfilled each individual request, designed participants guide, and speakers’ cards for social media. And finally, as he says, wrote so many emails that in the meantime, he began to dream of them. During the event, while taking care of technical support, he sat in a room with a demanding door sign “Do not enter’’ – Nothing strange after everything he did. Darija, known as a woman of red hair and trenchant voice, forced participants to go on breaks between the lectures, but it was much more difficult for her to make them return. In charge of the entire program of the conference, she communicated with guest speakers in an excellent and professional way and did her best to keep the topics interesting and interactive. Sustainable urbanism has become clearer thanks to her. Andrijana, queen of logistics, has achieved tremendous success because there were no participants who didn’t praise timing and the fact that there was no delay. Thanks to her, breakfast was served on time, the vegetarian pizza was delivered, sweets were sweeter than usual, and coffee woke up even those most tired. With coordinating volunteers and all their tasks, she showed that no goal is unattainable and that everything can be done with good logistics. She is almost about to start teaching it. Kristina, lead negotiations with potential sponsors and for months endeavored tough talks for realizing the conference. Eventually, she managed to find those who recognized oikos Belgrade. She rushed in and out of meetings, dialed dozens of numbers and read emails so many times that almost each one of them she knew by heart. She used every opportunity to take photos for the Instagram story and, last evening, even said that she’s about to cry because of the achieved success. But did she? – it shall remain a secret. The Spring Meeting experience was also made possible by volunteers, who did their best to help everyone and for that we are immensely grateful to them! 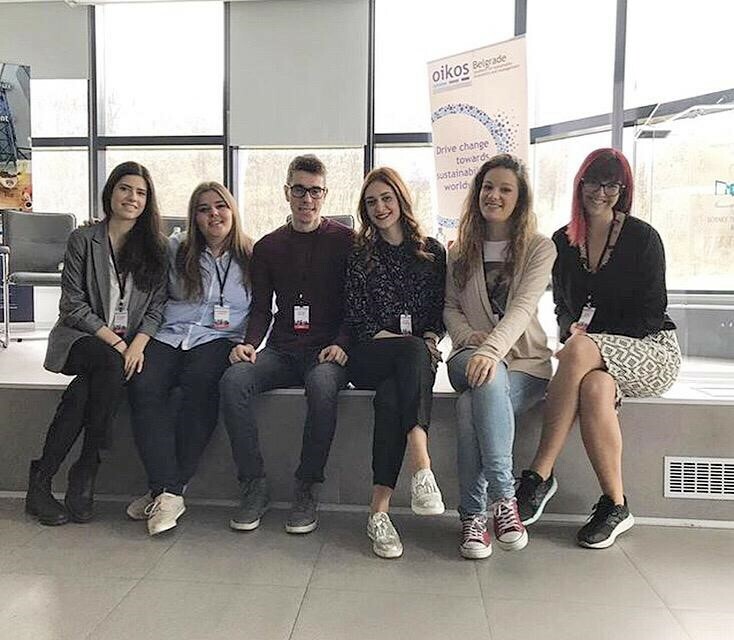 And someone without whom this opportunity wouldn’t appear, and from whom the story of oikos Belgrade started, is Stefan Dedović, the founder of the organization, always there to give advice, organize something at the last minute, hold an inspirational panel discussion and put a stamp on the Spring Meeting 2019. For more impressions, contact participants, whose feedback is the best sign that we’ve done a great job! 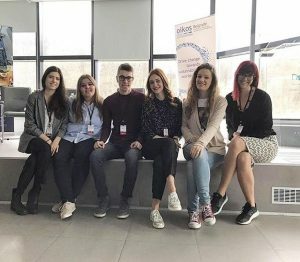 In order of appearance, here is the amazing Spring Meeting team: Zvezdana, Aleksandra, Stefan, Kristina, Andrijana, Darija.